Review of Harp Lager | Beer Apprentice - Craft Beer News, Reviews, Interviews and Info. 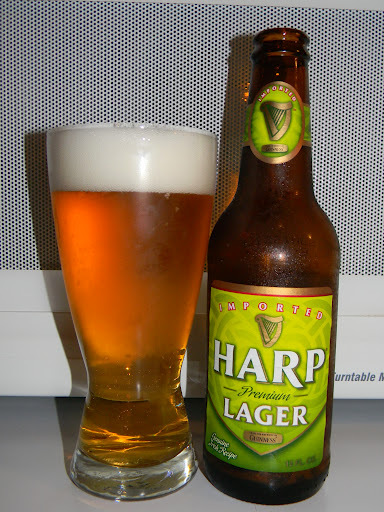 For today’s craft beer review, and in honor of St. Patrick’s Day, I’m going to be trying a Harp Lager produced by Guiness Ltd. located in Dublin, Ireland. It’s been forever since I last had this brew. Let’s forgo all of the small talk and find out what the commercial description says from the website, ratebeer.com, since guinness.com had no information regarding this beer. This beer comes in a 12 oz. bottle and it has an ABV of 5.0%. It poured a very clear golden/yellow color with a bright white head that was of good size, smooth, soft and just a wee bit soapy. The retention time and the lacing weren’t bad at all. A pretty decent looking beer to tell the truth. Overall, it had a very mild nose. It was clean though. Relaxed grassy hops and hints of grain joined forces with some light bread and cracker innuendos. An extremely delicate fruitiness added a touch of complexity, however, for the most part, it was rather straight forward and typical of an average Lager. The graininess came out a bit more in the taste. It was fresh and clean with an easy hop taste and the bitterness was kept to a minimum. Flavors of cereal grain and bread let loose a dainty earthiness. Again, just a gentle sweetness and fruitiness was accounted for. Much like the aroma, the savor was modest and mild mannered. The mouthfeel was medium to medium/thin. Quite dry, smooth, snappy, crisp, refreshing and thirst quenching. The carbonation was ok, but only a sparse amount of flavor was left behind after each swallow. Well, this beer was super easy to drink that’s for sure. I was through the bottle before I even knew it. It was, for the most part, just an average beer I thought. This would be an outstanding Summer or “lawnmower” beer. A person could pound several of these without any trouble whatsoever. I seem to remember liking it more back in the day. I guess we all did though, huh?. I definitely wouldn’t go out of my way to find this, but if it came down to having this or having one of the “Big 3”, I would choose the Harp Lager every time. It has nothing off putting or obtrusive, however it doesn’t really present anything that’s extraordinary either. Just an easy going, no-nonsense Lager.